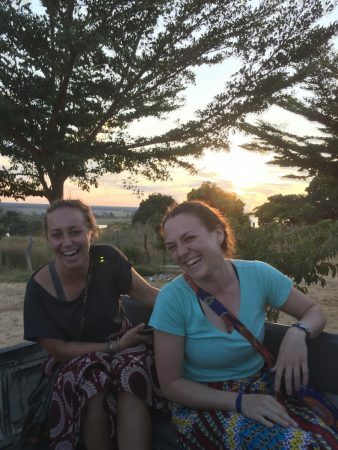 Morgan (right) with Gonzaga alum and current Peace Corps Zambia volunteer, Katie Polacheck (2017). On the morning of Sunday, May 13th, I received my invitation to join the Gonzaga University Alumni Association. On Tuesday, May 15th, I said goodbye to my life in Spokane and got on a plane, starting my journey to Zambezi. There I started my transition out of the Gonzaga bubble. Today is Tuesday, June 12thand I find myself closing another chapter of my life, Gonzaga-in-Zambezi. I have been filled with joy, enveloped in conversation, failed, questioned, and learned more than I ever expected. But my Gonzaga-in-Zambezi experience is the final chapter in Morgan Schindele’s Gonzaga story. I will not be returning to campus to be surrounded by my other Zam Zags. I will be starting a life in a new city, with new people, and hopefully a new job. The return to the states means more confusion and uncertainty for me. As I look at everything I have experienced the past month, my reflections and critical thinking cannot end when we fly out of Lusaka, it’s only the beginning. For the past month I have been the only graduated senior on this trip. The majority of our group is starting their journey with Gonzaga and its connection to Zambezi, but I have closed the Gonzaga door. I have felt isolated because I am at a different stage of my life than all of the other students. I will not return to Spokane in the fall, I will not be on the retreat, I will not get to talk to the next group that teaches the computer course during their spring class. There are a lot of differences. Throughout my time both preparing for this experience and living it, I have focused too heavily on the differences between myself and the rest of the students. There are many differences, and my life is filled with ‘lasts’, but our differences are what bring out the important conversations. We do not have to agree with each other, or be the same age, or be in the same stage in our lives. We do have to listen to one another. At the start of the trip I was very focused on differences between my needs compared to the other students. I found that I separated myself from my fellow Zags. I neglected the relationships that should have been the easiest. Although I will not be returning to Gonzaga, these relationships matter. Each person has a different depiction of what Zambia was to them. My story is not the only story that will be told. Each perspective holds an important piece of what this experience has been. We will never have the whole story, we will never know every story, but we need to keep listening. I need to keep listening. When I came to Zambia a month ago, I only listened to the stories of the new people I was meeting. I neglected the stories of those sleeping under the same roof as me. We have spent a lot of time reflecting throughout out Zambezi journey, and that is when we learn the most about our group. That is where I learned that it is okay to disagree, be different, and still be able to have a conversation. This is something I will take back with me. The ability to productively argue, to ask questions of one another. It is important to be comfortable being wrong, and asking questions about what you do not understand. Coming back to the states, I find myself in dire need of more reflection. What has happened over the past month I could not possibly type in this post. I cannot comprehend all that has occurred and all the thoughts that inevitably will be circulating for the months to follow. I look forward to being able to have these conversations with my fellow Zam Zags. Moving 3 states away to Laramie, WY, forces me to be intentional with the relationships and conversations with the friends I have gained and have shared this time with. Many things we can relate on, but many things we have experienced differently. My time here has taught me that the differences we experienced are crucial to talk about. I hope I never stop asking questions, and I hope people never stop asking me questions. We have shared stories, friendships, struggles, privilege, but now we are closing our Zambezi chapters. My struggle now is the fear of returning, of being alone and away from those that know what I am feeling. My reflection upon returning to the states will different than many of our other Zags, but we will all have moments of feeling alone and that no one understands. The process doesn’t end here, we will still need each other, need the stories, the conversations, and the friendships. As I pack my bag filled with gifts for loved ones, I am filled with sadness to leave. Yet I am also filled with joy that I have 21 other Zags who will not forget their time in Zambia. The young souls of the Zags still in their undergrad have fresh perspectives and are less bitter then my aged soul. I have observed the different ways we each form relationships, and learned ways of being more intentional in conversations. I have learned from everyone I have interacted with on this trip, but I am thankful that the other Zags have helped me see that difference stimulates growth. Laramie is waiting for me, but Zambezi will always be on my mind. The friendships, young and old, will never be forgotten. The combination of Zags and Zambians, and everything in between, has given me endless conversations, endless questions and families on all sides of the world. Thank you Zambezi, Gonzaga, all of our loved ones, and bell hooks, for changing my perspective. I am writing the last page of my final Gonzaga chapter, closing the book. Wow. Can I RT everything your wrote? Even a year later your reflections are helping me to feel a little less alone and insane in processing my experience in Zambezi having been a post grad senior on the trip. Such a unique perspective you were able to bring. I know for a fact that your presence in this group of younger zags enriched their experience as much as they deepened yours. First year of post grad- what a beautiful beast. I can tell you that yes, there will be plenty of moments of loneliness. You probably felt those moments in Zambezi too. Times where you wish you had someone to process with who had some context. Don’t forget to reach out and lean on dear friends and family when you need to…even if that is everyday at times. You may be starting a new adventure independently, but that does not mean you are meant to do it alone. I’m sure your Zambezi Zags will be cheering you on from Spokane this year! Best of luck to you, Morgan! The world outside of Gonzaga is anxiously awaiting your arrival. What a gift you will be. You are courageous, powerful, thoughtful, empowering, and reflective. This post was a beautiful closing page to your Gonzaga book and I can’t help but be greatful and humbled to be a part of your next book too. Im looking forward to endless porchtime talks filled with stories, reflections, and conversations of experiences I may not understand or have lived through, but will learn through you. This was a wonderful read, so let me start by saying thank you. It’s one of the things I learned how to do better in Zambia – to stop, to think, to consider words and their meaning, to look at and feel the fabric of the person who is speaking them, and hopefully to celebrate their meaning, regardless of whether I agree or disagree with the message. Zags-in-Zambia, so many of whom I count among my friends, along with a group Zambians who are now a regular presence in my life through messaging, texts, and phone calls – these friends will stay in my pages. It takes a bit of work but the rewards are awesome. And those interactions keep the book open, keep the pages turning. As a child, I was taught to keep the light over the front door on, just in case a loved one was lost and needed to find their way home. Consider keeping your light on, so that you can continue to ask the questions, challenge the perspectives, and serve the ones you love. Don’t forget that they love you, too. Good luck, Morgan – Laramie is about to be an even better place to live! I love the beautiful imagery of closing a book. It feels really strange responding to your blog with you home. I am always so impressed by you! Knowing that everyone is different and has their own opinions. Respecting those differences and knowing that you have more in common than you think. These are some of the best lessons you can learn. The Gonzaga chapter of your life may be over but turn the page and get excited for the Laramie chapter. Remember we all have times when we feel alone and no one understands. Your family and friends are here to listen and help you through those times.